Shanay Thompson does it all: medical student, NBC contributor, former model. But she didn’t stop there. In 2017, upon realizing the prevalence of food insecurity among at-risk youth she mentored, Shanay founded Every Kid Fed, a nonprofit organization that focuses on ending childhood hunger. 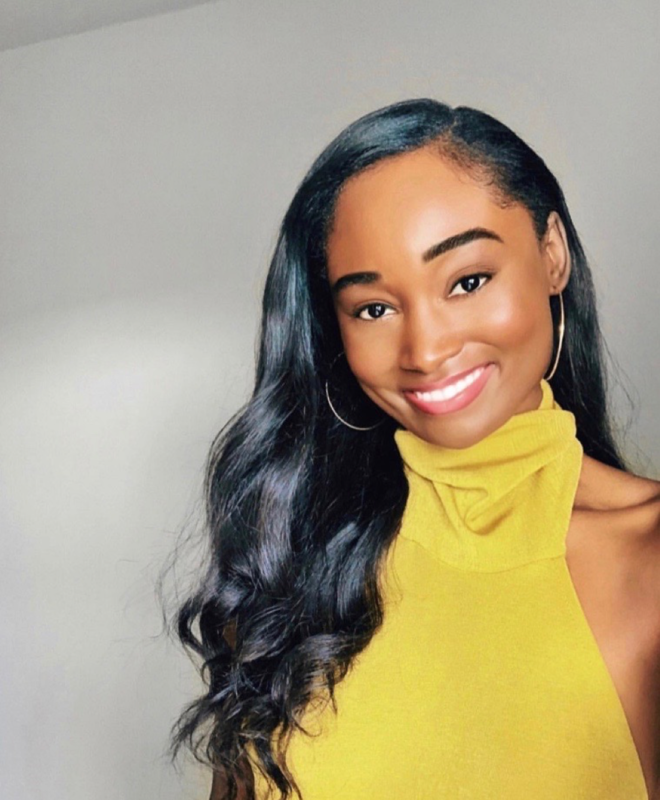 Below, Shanay shares how she manages her time, what advice she has for women of color looking to start their own nonprofit, and what she wishes people knew about food insecurity. You were a Wilhelmina model before you quit to pursue medicine. When did you realize you wanted to change careers, and how did you go about making that career shift? When I started modeling, my intent was to do shoots here and there for fun while I was in school, until one day I started getting booked for shoots and shows that I didn’t want to pass up. Throughout college and graduate school, I would be on the plane or backstage in hair and makeup at New York Fashion Week, doing coursework, and when I got into medical school, I knew I had to make some serious adjustments. After having modeled for spectacular designers, fashion magazines, and doing pageants in between - as thrilling as it was, I wanted to do more in terms of impactful work. I knew I wanted to empower women on a larger platform and put my education to good use, so I met with my agent in 2015, and terminated my contract amicably. Modeling will always have a special place in my heart, as it was such a integral part of my life for years. I still keep in touch with friends in the modeling industry and attend shows, so I’d say it’s certainly a win-win! How did you first come up with the idea for Every Kid Fed? How did you transform that idea into a reality? Parents who struggle to make ends meet but still make slightly over the amount required to qualify for free/reduced lunch program have children who are food insecure. Those children often resort to stealing food. Students who do qualify for the free/reduced lunch program, often get bullied, and are labeled as poor in front of their peers, so they skip eating altogether. Students who utilize the free/reduced school lunch program still go hungry, as the meals aren’t enough to sustain them throughout the day. With that information, I created Every Kid Fed. Each food pantry location is on campus in a discreet location for students in need. The school pantries complement the free school breakfast and lunch programs by providing access to food for all food insecure children during and after the school day has ended, on the weekends and during holiday and summer breaks. The pantries are stocked with non-perishable food and vegan/vegetarian-friendly options. I started off by using some of my funds to stock the pantries, and now we have secured partnerships with local businesses and companies to keep the pantries stocked. We now have fed over 9,000 students in need, since launching in July 2017. You’re in your last semester of medical school, and you were recently made a medical contributor at NBC. How do you manage your time with all of your different responsibilities? It is truly such an exciting time for me, and life is certainly busy! I feel like I do a great job with keeping a great work/life balance and the key is organization and simplicity. Each week I make a small list of my goals in my agenda, and I keep a set schedule in the Awesome Note app of everything from my clinic schedule, business travel, meetings, events, yoga and pampering time, and more. I highly recommend that app. 6am: Yoga or pilates and while getting ready, I’ll have Project Juice delivered for breakfast and check the stock market since I have shares in few companies. I then check my schedule for the day, emails, and check in with my executive assistant Elaine regarding Every Kid Fed, then head to the hospital. Noon to 1:30: Lunch - I spend that time studying, replying to emails, sometimes squeeze a meeting in, or do the online food shopping for my pantry locations. 6:30ish: Cooking a vegetarian dinner while listening to podcasts, or going out to dinner with my love. 9pm: Catching up on health news and working on my next assignment for NBC. What do you wish more people knew about child food insecurity? The facts. Whenever I explain Every Kid Fed, I always give statistics. Currently, 1 in 4 children in California are food insecure, and 7.9 million Californians are living in poverty. Second, is the devastating ramifications that go beyond a growling stomach - hunger impedes on the ability to learn and achieve optimal physical and mental health. Low-income children are the most vulnerable especially in schools. Many of them suffer in silence, so it’s our duty to be an advocate and to make sure no child ever has to worry about where their next meal will come from, and to give parents who are struggling to feed their family a helping hand. What advice do you have for women of color looking to start their own nonprofit? Don’t be afraid to ask for help. As black women, we have been conditioned to jump higher, run faster, be stronger, independent and yes, we are strong, independent warriors full of black girl magic - but it is absolutely OK to ask for help. You can be great, but behind every successful person or business, there is help. I had trouble with this in the beginning, but when you decide to start a nonprofit or anything for that matter, it is 100% a collaborative effort. How do you go about creating change in a community? Know what you want to accomplish and be passionate about what you do. Creating change doesn’t happen overnight, so you have to be prepared for the long haul. Your conviction to the end goal is what allows it to come into being. Trust your vision and don’t let fear deter you from making an impact. What and/or who inspires you? Meeting new people inspires me everyday. As a student doctor, medical journalist, and social entrepreneur, I’m constantly meeting new people and listening to their stories. It truly keeps me motivated to do everything I can to cultivate positive change and inspire the next generation. What’s the next step for you and Every Kid Fed? We have now transitioned into serving high poverty elementary schools exclusively, and are continuing our work to end childhood hunger by partnering with city councilmembers and the CA Department of Education to implement universal school lunch in all California schools. This will erase the stigma, peer shaming, and increase free school lunch participation. We are also launching our $10 or less meal recipe division on our website in April for parents. As for myself, I’m preparing for the launch of my new book, She Can, releasing on June 18th, graduating from medical school, starting residency, working on more exciting projects and gearing up for a much-needed vacation to Italy! If you’d like to help Every Kid Fed in any capacity, please visit everykidfed.org.